Welcome back to our home. While last week we showed you the initial entry way to our home, this week we will journey down ‘the hall’ to the kids’ rooms. Next week, Eric’s and my bedroom will be featured. Follow me down the hall to see where the gothlings dwell. Spiders and bats and ballerinas. Oh my! Welcome back to the tour. We had company yesterday afternoon, plus two kids needing transportation to and from birthday parties. 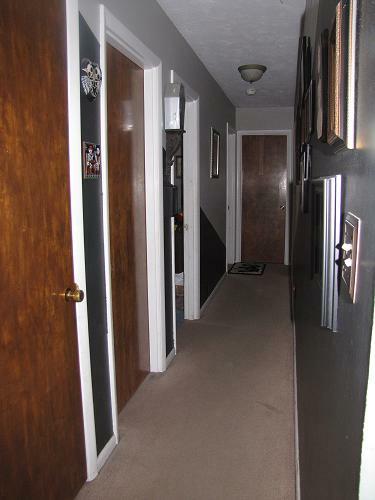 I was able to photograph the new areas of our home, but didn’t find the time to guide you through. As Scarlett O’Hara said, “Tomorrow is another day,” and well, here it is. Welcome back to our home. While last week, we showed you the initial entry way to our home, this week we will journey down ‘the hall’ to the kids’ rooms. Next week, Eric’s and my bedroom will be featured. Dollies, dresses, and blankies… oh my! I have great plans for new items for Bats! meow… I also have great hope that the time I need to draft the patterns and sew some samples will just appear in my life. First up are a couple of new dresses or, maybe skirt and top sets. The way this usually works is I determine what my girls want and then sew for them. If the design is a success [as determined by the ooos and aaahs of the 6- and 7-years old girls in the house and in the neighborhood], we’ll photograph, do the price workups [cost versus profit], create the web listing, and work on alternate size options – not necessarily in that order. Next up are a set of rag dolls. Or something of that nature. I’m super excited about this. When I was a little girl, all of my baby dolls [and I had a LOT of baby dolls with ALL the accessories] were little blonde things with bobbed hair. They didn’t look anything like their mama. Even the baby dolls in our house are 90% blondes. I do believe it’s time to expand the market to include more of the ‘looks like me’ variety. Of course, there is more in the plans than just brown hair and grey eyes. I’ll share more as soon as something has been sewn and stuffed. I’m really looking forward to this! Finally, I want to incorporate my love of quilting into our designs. More housewares, some quilts for babies, even some pillows for bigger kids and adults. But not just any design will do – we’ll need something special, so more designing on real life graph paper. So much to do. Such great plans. But time, again, is the enemy.